I chose an Elegant Woodlands theme for Christmas At The Cottage in 2012, using earthy greens, rich metallic colors and decadent browns as my theme that year. 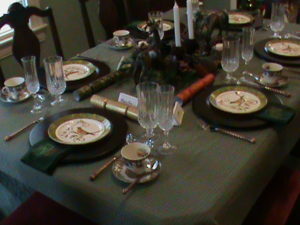 A sage green tablecloth of unknown manufacture (thrift store) served as the base, with complimentary hunter green napkins with an embroidered pinecone motif (Bed, Bath and Beyond). Wooden chargers (Walmart) held the Robin plates (Pier 1). I used my beloved Spode Woodland tea cups and saucers (Cash’s of Ireland), perfect for the theme and very complimentary of the Robin plates. Crystal stemware is Cris d’Arques from France (thrift store), and the flatware is a copper clad set made by Gibson and marked through Herberger’s Ruff Hewn brand. The centerpiece is a bronze metal pinecone candleholder (thrift store) holding two faux pinecone candlestick holders (Leslie’s Hallmark), with faux pine branches and copper colored berry picks (Ben Franklin Crafts). The bronze deer were found in a now-defunct catalog called Terry’s Village. Christmas crackers found at Pier 1 in the exact colors of the theme made great party favors, and little white porcelain re-useable place card holders let guests know where their special seat was located.